"Under the fence, Catch the sheep, Back we come, Off we leap." This is the little verse used to help children remember what to do with the yarn when they learn to knit. I must have said it one hundred times today. Elliot learned to finger knit in school, and I do some occasional knitting. He's been bugging me for months to knit "using the needles, Mom." I've been putting it off, convinced that learning to knit would be only an exercise in frustration for a six year old boy. Oh how we do underestimate our children sometimes. In an attempt to get over our sad goodbyes to Wayne & Arlene today I decided to give the boy some needles. Quinton was unhappy, but you seriously can't give a three year old knitting needles. Especially a creative one. 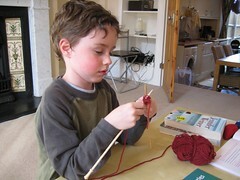 And I'll be darned - that boy is knitting! He persisted through stitch after stitch, row after row. I'm so proud. Elliot had this attitude of like "of course I can do this, Mom." What a riot. Lookout ladies of the world....who wouldn't love a man that knits? ?